I.G. 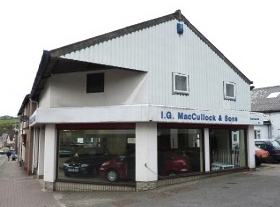 MacCullock & Sons can provide a complete range of garage services to help keep your vehicle in the best possible condition. In the event of a breakdown we can recover your vehicle to our workshop and endeavour to get you back on the road as quickly as possible. Our friendly and skilled mechanics will aid and advise you on the appropriate course of action needed. Quotes for parts and labour are available. Please come in and see us or call 01837 52776 for more details or to book your vehicle in.